“World’s Largest” is definitely a sought after goal, especially in the construction industry. Sarens, a crane rental, heavy lifting, and engineered transport company in Belgium, has recently released a supersized crane that is being regarded as the largest crane in the world, by both size and lifting capacity. The brand new Sarens SGC-250 is the 3rd in the line of Sarens’ Giant Cranes and the company’s biggest to date. Unveiled at an inauguration event on November 9, 2018, in Belgium, the new crane can lift a maximum of 5500 US tons and has a maximum height of 820 feet (250m). The swing radius of the massive machine spans over 900 feet (275m). Incredibly, the SGC-250 doesn’t have to stay stationary, as it has one set of wheels to allow it to slew 360 degrees and the other set allows it to travel. 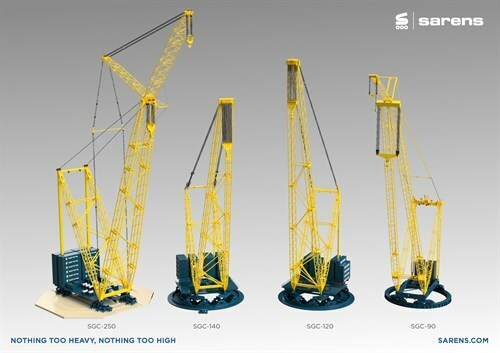 No other cranes in Sarens fleet have that ability, which the company says is an industry breakthrough. The travelling wheels also hydraulically retract until the crane needs to move. The first jobsite for the giant crane will be the Hinkley Point C nuclear power station in the UK. According to Construction Enquirer, the crane will be used to lift in excess of 600 pre-fabricated components, which include “five major parts of each nuclear unit’s steel containment liner and dome.” It will take an incredible 280 truck runs to deliver the entire crane to the jobsite.